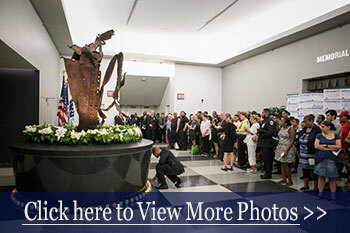 On Sept. 9, John Jay once again paid tribute to the 68 members of the College community who were killed in the Sept. 11, 2001, terrorist attack on the World Trade Center. This year, however, on the 15th anniversary of the attack, the remembrance added a somber extra dimension, with the unveiling of a plaque honoring those who have since died of illnesses stemming from their rescue and recovery efforts at Ground Zero. The moving ceremony in Monument Hall — the space that joins Haaren Hall and the New Building — included the City University ROTC honor guard, the national anthem sung by Professor Gregory Sheppard, and the recitation of commemorative poems. The throng in attendance from the John Jay community was joined by dignitaries who included Manhattan Borough President Gale Brewer, NYPD Chief of Department (and Commissioner-designate) James O’Neill (B.A. ’88, M.P.A. ’93), First Deputy Fire Commissioner Robert Turner II (B.A. ’12), Port Authority Deputy Chief Security Officer Thomas Belfiore (B.A. ’79, M.A. ’96), and others. As the names of those killed in the attack were read, students came forward to place votive candles at the base of the memorial, the centerpiece of which is a twisted piece of structural steel recovered from the ruins of the Twin Towers. “We hope that in years to come, generations of students to come will see these names and realize that the people named here were once like them,” Travis said. Travis, Turner, O’Neill and Sally Regenhard, mother of the late Firefighter Christian Regenhard, then unveiled the new memorial plaque. “We want to recognize those of our community, those first responders at Ground Zero, who gave so much of themselves, even their lives,” the President said.